Flautissimo is a charity, and we are always looking for organisations, no matter how big or small to sponsor activities, purchases and events. 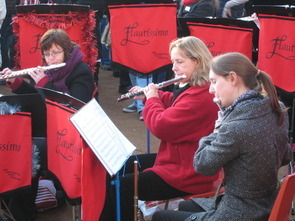 By sponsoring Flautissimo you will be helping a well established and successful orchestra reach new heights. Depending on your level of sponsorship you or your company will be ensured advertising in our concert programmes with a link to your company on this page. Your company logo will also be on our publicity material such as flyers and posters. Sponsoring a specific item such as a commissioned piece of music or a music stand banner will ensure a personal thank you for your generosity in the next concert programme. Money can be donated to the orchestra by a cheque, made payable to Flautissimo, and sent to our Secretary at 27 Keble Road, Chandlers Ford, SO53 3DR.